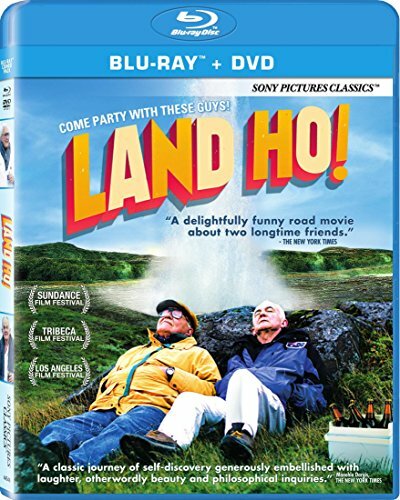 CULVER CITY, Calif. (Sept. 22, 2014) - Join Colin and Mitch, two retired ex-brothers-in-law hoping to reclaim their youth on a road trip through Iceland, in Land Ho! This charming comedy adventure from Sony Pictures Classics and Sony Pictures Home Entertainment debuts on Blu-ray(TM) Combo Pack and Digital HD Nov. 4, after earning "bravos!" from top critics and audiences at several U.S. film festivals, including Sundance, Los Angeles, Sedona and Tribeca. The film's odd-couple, played by Paul Eenhoorn (This is Martin Bonner) and Earl Lynn Nelson (Pilgrim Song), look to "get their groove back" in the quirky tale that The New York Times hailed as "a delightfully funny road movie about two longtime friends." Variety's Justin Chang considered the performances to be "pitch-perfect," and The Wall Street Journal heralded the film as "a breakout film in every way." With Iceland's awe-inspiring landscapes and trendy capital city Reykjavik as the film's backdrop,Land Ho! is both a throwback to classic bawdy road comedies, as well as a candid exploration of aging, loneliness and friendship. Bonus features include a commentary with Paul Eenhoorn, Earl Lynn Nelson, Martha Stephens and Aaron Katz, as well as an LA Film Festival Q&A and deleted scenes. Raised in Appalachian Kentucky, Martha Stephens graduated from the University of North Carolina (UNC) School of the Arts. Her first feature, Passenger Pigeons, premiered at the 2010 SXSW Film Festival, and won Chicken and Egg Pictures' "We Believe In You" Award. Her second feature, Pilgrim Song won the Best Director Award at Fantaspoa Film Festival and Best Southern Film from Oxford American Magazine's Indie Memphis Film Festival. Hailing from Portland, Oregon, Aaron Katz studied filmmaking at the UNC's School of the Arts where he met Stephens. His first film, Dance Party, USA, was an Official Selection at 2006's SXSW Film Festival. Quiet City, his sophomore feature, premiered at 2007's SXSW Film Festival. The Brooklyn-set romance was selected by Stephen Holden as a New York Times Critics' Pick and received an Independent Spirit Award nomination. Cold Weather, which premiered at SXSW and was released by IFC Films, was dubbed by Indiewire as "2011's first great American indie" and was ranked on several critic's Ten Best Lists. The film has a runtime of ~ 95 minutes & is rated R for some language, sexual references & drug use.